Matt and I have lived in our house for almost 2 years. The previous owners smoked and it appears as if they did not keep the floors very clean. We have laminate flooring in our kitchen and it’s about twelve years old. With its age and previous care, it’s expected for it to have a dull and stained finish. We also use our kitchen door to enter our home, so we track everything right through the kitchen unless we remember to take our shoes off. 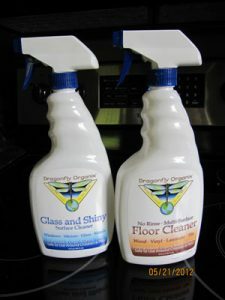 I had heard about a product called Dragonfly Organix Floor Cleaner and contacted the company online. I received both the floor cleaner and glass cleaner in a shipment today. OSM, Inc. makes the Dragonfly Organix line that includes products that are natural and environmentally responsible. Part of the reason I wanted to try their floor cleaner was to test it out on my very worn and dirty floor. I also was looking for an alternative cleaning product because I’m finding that I’m too sensitive to regular products. Especially with any products that come as a spray, I have a habit of inhaling the products shortly after spraying them. I tend to do spot cleaning quickly and find myself rushing around and not thinking about the fact that I should let the spray settle before continuing to clean. It’s hard to see in the photo, but my floor actually had a little bit of shine after I cleaned this section. One of the best parts of the Dragonfly Organix Floor Cleaner is that you just spray it on and wipe over it with a clean cloth. Usually when I clean a small section after a spill, you can feel your feet sticking to the floor. I didn’t have this problem with the cleaner. 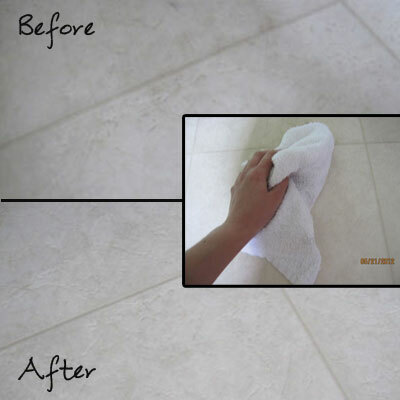 I had another area that I cleaned near the baseboards that had stuck on food and buildup where the mop had missed. It came up with a little bit of scrubbing. I had actually already tried a few floor cleaning products on this before and didn’t have any luck. I also liked the fact that it was almost odorless. It wasn’t until I got down on the floor to clean that I even smelled the product and even then it was fairly light. When I washed my hands, the odor completely disappeared. I also received the Glass & Shiny Surface Cleaner. I have a flattop stove that requires constant cleaning. Our water leaves behind white deposits that will stain our stove so I normally have to clean the stove as I’m cooking. Any food that sits on the stove too long will either stain or get cooked into the surface. 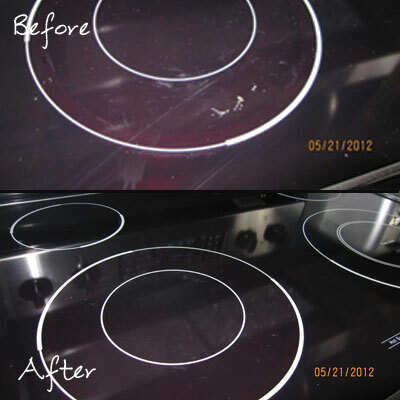 The before picture is what the stove looked like after using my regular ammonia based glass cleaner. As you can see, it left streak marks and didn’t even touch the food that was cooked onto the surface. I actually was a little upset yesterday when I tried to clean the stove and couldn’t get this food spot removed because I thought it would be there permanently. Minus the lint from the cloth, you can see that it did an excellent job! I also tried the Glass & Shiny Surface Cleaner on the bathroom counter and sink. The sink had a dull residue on it from toothpaste which normally is still left behind after using my regular cleaner. I actually stood back and admired my sink afterwards because it was shiny. As I mentioned earlier, I normally inhale my cleaning products by accident and I am very happy to now have a product that doesn’t smell like a heavy public restroom cleaner masked over with a not so pleasant imitation lemon scent. If you are interested in trying or learning more about Dragonfly Organix products, you can visit their website or contact them at 1-888-473-6499. You can also visit them on their Dragonfly Organix Facebook page and on Twitter. You may also want to listen to their popular radio show Green Revolution Radio. The Garden Guys discuss green living topics on Sunday mornings from 7AM – 9AM (EST) on 96.9FM WTKK Boston Talks and streaming live at www.garden-guys.com. It’s also available as podcasts. Some of their previous show guests included the Governors of Massachusetts and Vermont, Deputy Secretary of the USDA Kathleen Merrigan, NOP Director Myles McEvoy, USDA BioPreferred Program Manager Ron Buckhalt. In addition to a radio show, you can also get an e-newsletter, “Plant of the Week,” when you sign up at www.garden-guys.com. I had the opportunity to try the above mentioned products for the purpose of a review. However, my honest opinions were expressed in this review.